Portokali Cottage (Orange Tree Cottage) near Fiscardo, Cephalonia, Kefalonia, Greece - Idyllic location on edge of a small village overlooking an uninhabited, peaceful valley. The cottage gives travellers the opportunity to stay in a unique and individual property, unlike so many found in holiday brochures. It is full of character and ideal for those who are searching for a more unusual place to stay. Beautiful rural surroundings due to its location at the end of a track on the edge of a small village with views stretching down an uninhabited valley. 1 Bathroom with shower, wc and handbasin. Clean towels provided mid week. Open plan living/dining room with a sofa, futon and antique sideboard, tiled small tables and kilim rugs. Large dining table and chairs. Music centre, DVD player and TV with satellite receiver (free to air channels only). Free Wifi internet access. Open plan fully equipped with cooker, fridge-freezer, kettle, toaster and dishwasher. Small selection of dvd's in the house. 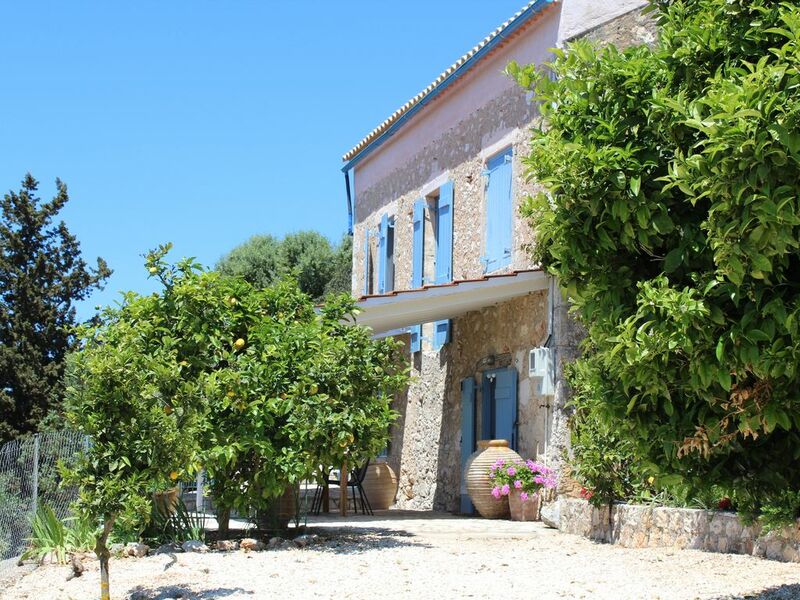 The cottage is surrounded by a mature garden with walnut, orange, lemon and olive trees. Colourful bushes and flowers in beds and pots provide splashes of bright colour. A large roofed terrace provides shade for al fresco dining. A second terrace has views over the Lixouri peninsular and the pool area has a beautiful terraced area with views over an unspoilt valley. Outside: The cottage is set in a garden of around a quarter of an acre with some mature trees including walnut, orange, lemon and olive trees. There are three terraces; the largest has a covered tiled roof to provide essential shelter from the summer sun. Surrounding foliage provides privacy and splashes of bright colours. A large wooden table and chairs on this terrace are provided for al fresco dining. A further terrace with a private swimming pool is behind the house and is totally secluded with beautiful views over a wooded valley that descends towards Cape Dafnoudi. A third terrace outside the twin bedroom overlooks the village towards Assos peninsular. Cleaning / Towels / Linen / Maid service: Towels and bed linen provided.The cottage is cleaned weekly with a bed linen and towels change. Clean towels are provided mid week. We ask that guests please bring their own beach towels. Portokali Cottage is perfectly situated in a small village close to two great beaches and the buzzy town of Fiskardo. The house is well equipped and furnished with great care and attention to detail. The two bedrooms are very comfortable. We enjoyed our stay immensely and would highly recommend it for others. The cottage is in a great setting; 10 minutes from Fiskardo and within easy reach of some beautiful beaches e.g. Dafnoudi, Agia Jerusalem and Alaties all of which were great for snorkelling. We can also highly recommend hiring a boat from Regina in Fiskardo and doing a day trip to Ithaca. On the way to the airport we stopped off in Argostoli and saw the loggerhead turtles which was an amazing experience. Nick and Abi we’re great; very welcoming and on hand for any questions. Our favourite cottage in the world! We can't fault it. My husband and I recently spent two glorious weeks at this beautiful cottage. Well equipped, totally private and lovely views over the valley and lemon, fig and orange trees in the garden. We had to drag ourselves away from the cottage to do some exploring around the island and decided that where we were was the best place to be. It was less than 10 minutes drive to the pretty harbour of Fiskardo where we enjoyed many morning coffees and evening meals in the wide range of restaurants. We highly recommend this property! We searched high and low for our dream cottage, when we found this on on homeaway we hoped we'd found it. From the moment we arrived we knew we had. The location is first rate, the view is breathtaking, the gardens well established and gorgeous. The pool area is beautifully done, the perfect place to sunbathe and cool off. The house is just our cup of tea, it is decorated throughout with such style, it's cool downstairs, and airy upstairs. We loved our time here, thank you Abi and Nick for the holiday of a lifetime. Excellent accommodation - comfortable and light - lovely stone work and wooden beams. Good food nearby and secluded beaches for swimming. Nearest beach is Alaties, five minutes by car or 20 minutes walk. Aghia Jerausalem beach is seven minutes by car or a 30 minutes walk. Foki Beach is 10 minutes by car, 40 minutes on foot. All of these beaches have a small taverna. The village of Manganos is approximately 1.5 kms away (a 5 min walk) and has a general store which sells a wide range of products from bread to swimming goggles! It also has a well stocked fruit and vegetable shop. There are two restaurants in the village; Ionio Restaurant is a well established and very popular taverna with delicious Greek cuisine. It has a weekly buffet night and a weekly Greek music evening. The other restaurant is a small grilled fish taverna in a picturesque, old establishment. Argostoli Airport is about 1 hour 15 minutes from the house. The sea port of Sami is around 40 minutes away. A hire car is essential - we email detailed driving directions before arrival. Village of Manganos with 2 tavernas, general store and a greengrocer is ten minutes walk up hill or a 2 minute drive. Fiscardo is a 10 minutes drive, Aghia Effimia a 40 minutes drive, Sami a 40 minutes drive and the capital Argostoli an hours drive. All timings approximate. Booking Notes: 25% payable on booking and balance 8 weeks before arrival. Changeover Day: Flexible Changeover dates are flexible but we prefer that guests don't arrive on Saturday. Guests are asked to leave the property by around 10am and arrive after 3pm. Notes on prices: Prices are per week in UK pounds and based on 4 people sharing the cottage. However, prices can be paid in euros, at the prevailing exchange rate.